One of the most often asked questions is what electrical devices you can bring from the US. The UK has a completely different electrical standard, voltage, frequency and plug type. This website and its author(s) will not be held responsible for any accidents or lawsuits that occur from following this advice, it is not professional electrician advice. The transformer will “step down” in voltage from 240 to 120v. From there you may want to plug in a US-style power strip and provide current for several products. you need to consider how many watts your transformer is providing (all transformers should clearly indicate this). The more wattage required by the electrical item(s), the bigger (and more expensive) the transformer will need to be. Add up all the watts that every one of the components will draw that will be turned on at the same time, then multiply by about 1.25 for good measure, and that’s about the size you need. So if you have three components drawing 30 watts each, get a transformer than delivers about 115 watts. Don’t try to draw more than what the transformer provides: you will be risking the health of you and your electronic components! UK outlets provide a frequency of 50 Hz. Transformers do not provide a conversion to US 60 Hz; you are stuck with UK 50 Hz. The only electrical products that need concern you regarding this frequency mismatch are products that contain motors (i.e. things that run fans, spin wheels, rotate things, etc. like hair dryers, record players). But...there are two kinds of motors that will be found inside electrical products, and one type is affected by the frequency, while the other is not. Synchronous motors are affected by the frequency mismatch. When such a motor made for 60 Hz receives 50 Hz, it runs at 5/6 speed. You will generally find that any product that contains a motor that runs at high speed (e.g. hair dryer), or must drive something with great force (e. g. power drill) will be a synchronous motor. DC motors are not affected by the frequency mismatch, because the motor runs on DC (for which frequency is irrelevant) and the DC current is supplied internally by the product. Thus, as long as the product gets current from a proper transformer, the motor inside will run at the correct speed. Generally, any product which requires only a small motor (e.g. Walkman cassette player, computer disc drive) uses its own low-voltage (5 or 12 volts) DC motor. Some products (rare, and perhaps even illegal by UL standards) are rated for no lower than 60 Hz, and will overheat when supplied with 50 Hz. The only way you can be sure is to find out the minimum frequency that the product may be run at (which should be 50), for which may need a trained electrician if the manual doesn’t say so. But if the item is a modern product by a company with a good reputation, you probably needen’t worry. 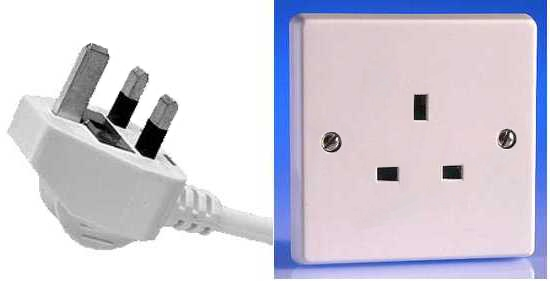 There is only one type of plug in common use in the UK, a three prong plug, larger than the US three-prong equivalent. There is an older, two prong plug which apparently is still in use in older dwellings that haven’t been updated, but they are very rare, even in quite old cottages. So if a salesman selling you UK/US adapters tells you need to need to be equally prepared for both kinds of plugs, he’s wrong. 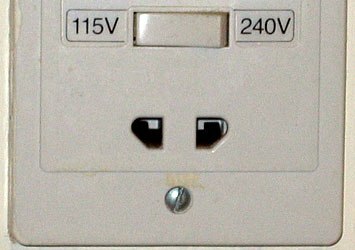 The UK plug also differs from the US one in that a fuse is contained inside the three pronged plug. Until recently, when you purchased an electrical product often times it would have no plug at the end of the power cord, which you’d have to buy separately and attach yourself. The practice has recently been discontinued (supposedly abolished by law), so you may not even encounter the problem. You’ll also discover that most UK electrical outlets have switches on them, like the switch on a power strip. And, like all other switches in the UK (such as those used for room lights) the effect of the position of the switch is opposite that of the US: down means on, up means off! Appliances, Bring or Buy New? Easily replaced items that draw vast amounts of current are unwise to bring because the cost of the transformer you will need for them will probably be several times more than the cost of buying the product new in the UK! These are items such as hairdryers and kitchen appliances, or others with high speed motors. Your US-made LP record turntables or cassette decks may contain synchronous motors, in which case they will run at 5/6 speed, or about 3.2 musical semitones too flat (yes, bad enough that it will ruin the music. Battery powered Walkmans and devices with AC/DC adapters would be fine, though, even when run with the AC cord. Old Tech: Your American-bought TV sets, Video Cassette machines, and the cassettes that are made to play on them, are likely to be of little use to you. If you bring both your TV and VCR/DVD/Blu-ray from home, the only thing you will be able to do with them (after you’ve bought the gigantic transformer you’ll need to convert the watts) is watch American-made videos on your VCR. You will not be able to watch British TV broadcasts, or British-made video tapes, nor will you be able to hook up a British-made VCR to older tube TV set. This is because both British TV sets and video equipment (yes, both) run on a different video standard than in the US: the standard in the US is NTSC, while in the UK it is PAL. 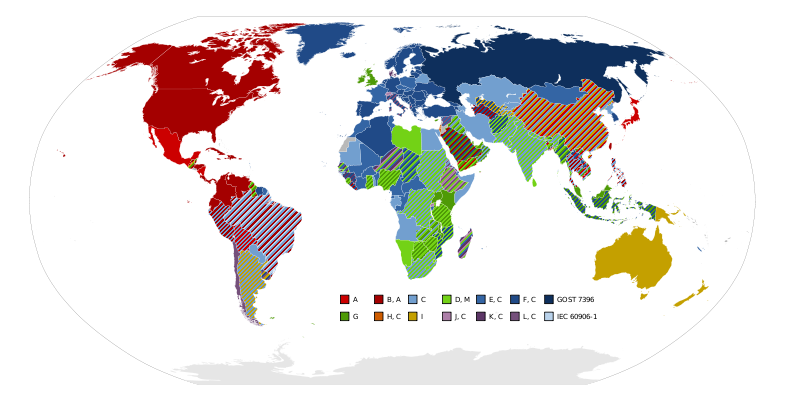 (And by the way, France uses an even different standard, called SECAM.) Don’t be confused by the fact that the physical video (VHS/DVD/Blu-ray) and looks just like the ones back home: although they are the same media, the information is encoded on them differently. IF an LCD/LED/HD television is dual voltage, your TV would still need to support PAL's 25fps (frames per second) to work in the UK. So have a look around in the TV settings menu to find out, it seems that most do not. Digital radios (car radios, Hi-Fi tuners) may not work very well, since the channel step in the UK is in units of 9kHz, while in the US it is 10kHz. So your US-made radio may “miss” all the right frequencies. You can buy special US appliances like refrigerators, washers or dryers, that can run on UK current and have them shipped to the UK. There are such things in export/import shops online. But save yourself supreme embarrassment and measure the doors and hallways of the house you will be living in; will the products fit through the door? One reason that the UK version of these products are smaller is due to a smaller sized door standard. If you’re lucky, and this is getting more and more common, perhaps the item you want to bring runs on both standards of current and frequency. The good news is that more and more products are being built this way, especially consumer stereo items, and computers. You can find out if you have such a product by looking near the spot where the power cord comes out: if it says something like “AC 100-240, 50/60 Hz”, you are in luck! You won’t need a transformer at all, just a plug converter or a replacement cord, like with a PC computer/laptop, which you can get at many electronics shops. Make sure to check this for EVERY product that needs to be plugged in. Video Games and systems are tricky as well, older American console game systems such as Nintendo and Sega are for NTSC televisions, and probably won’t work on a PAL television in the same way that the videos don't play. The older Nintendo DS games played on either US/UK systems, but the newer Nintendo 3DS has killed that ability now too. It normally specifies the region limitation on the back of the game box. Most Playstation, XBox and Nintendo Wii games are region protected. Some PC games may be as well. Times have changed and we have moved on to DVDs and Blu-ray. But of course the industry has created region coding to thwart consumer efforts to get discs as cheaply as possible by using region coding. 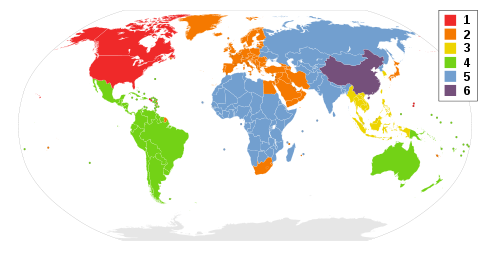 Region 1 is the USA and Canada. Region 2 is Europe and a few others. If you put the wrong region dvd into a DVD player or computer DVD drive, it will give an error and not play. With computers, you are normally allowed to switch DVD regions up to 4 times only. There is a little piece of software out there to get around this, one freeware called DVD43. There are also multi-region DVD players available for less than £100. As a family with children, and grandparents wanting to send us DVD's, we found having one a necessity. Laptop and desktop computers are easier to adapt to the UK electrics. Laptops merely require a UK AC adapter, most of the same brands exist in both countries. Even if it's a machine that is rare, you may still find the needed parts on Ebay. Desktops often have a switch on the back of the machine to switch between power supply types, 120v or 240v. If it does have that switch you can just buy a new power cord aka lead quite cheaply. If it does not have this switch, you can most likely buy a replacement power supply unit (PSU). There are broad differences in terms used by American and British terms related to plugs and power sockets. mains power line power The primary electrical power supply wires entering a building, connected to the Main fuses or circuit breakers. There is also the UK Shaver Socket, the only electrical outlet in a UK bathroom for safety reasons.